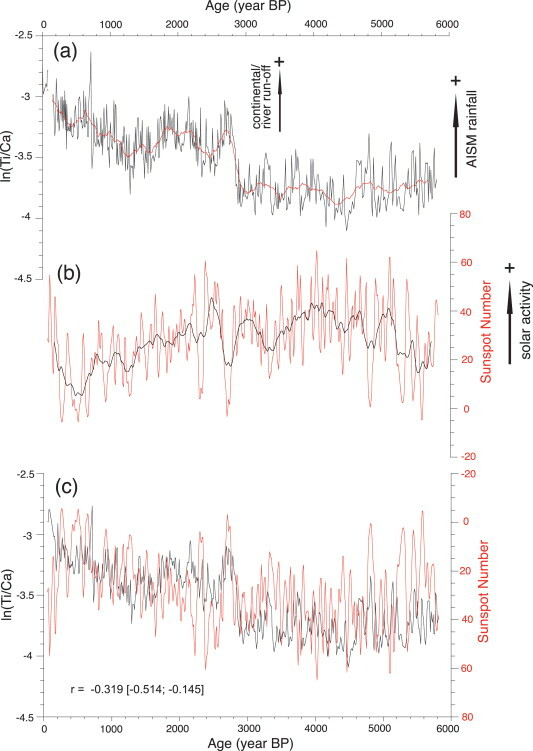 A paper published today in Quaternary Science Reviews finds precipitation in Australia was correlated to solar activity over the past 6,000 years. According to the paper, an "abrupt increase in rainfall 2,800 years ago coincides with a grand solar minimum" and "Increased rainfall in response to a solar minimum is consistent with climate model simulations." The paper also shows also shows solar activity in the 20th century was at some of the highest levels of the past 6,000 years. The paper adds to many others finding solar activity drives the hydrological cycle, another solar amplification mechanism by which tiny changes in solar activity are amplified to large scale effects on climate. Top graph is rainfall proxy, middle graph is solar activity, bottom graph shows the two superimposed with solar activity flipped since low solar activity is correlated with increased rainfall. Graph also shows solar activity in 20th century was at some of the highest levels of the past 6,000 years. Australian–Indonesian summer monsoon (AISM) rainfall changes over the past ∼6000 years. Abrupt increase in rainfall at ∼2800 yr BP coincides with a grand solar minimum. Increased rainfall in response to a solar minimum is consistent with climate model simulations. Combined effect of orbital and solar forcing on AISM rainfall. No significant control by long-term variations in ENSO. The Australian–Indonesian monsoon has a governing influence on the agricultural practices and livelihood in the highly populated islands of Indonesia. However, little is known about the factors that have influenced past monsoon activity in southern Indonesia. Here, we present a ∼6000 years high-resolution record of Australian-Indonesian summer monsoon (AISM) rainfall variations based on bulk sediment element analysis in a sediment archive retrieved offshore northwest Sumba Island (Indonesia). The record suggests lower riverine detrital supply and hence weaker AISM rainfall between 6000 yr BP and ∼3000 yr BP compared to the Late Holocene. We find a distinct shift in terrigenous sediment supply at around 2800 yr BP indicating a reorganization of the AISM from a drier Mid Holocene to a wetter Late Holocene in southern Indonesia. The abrupt increase in rainfall at around 2800 yr BP coincides with a grand solar minimum. An increase in southern Indonesian rainfall in response to a solar minimum is consistent with climate model simulations that provide a possible explanation of the underlying mechanism responsible for the monsoonal shift. We conclude that variations in solar activity play a significant role in monsoonal rainfall variability at multi-decadal and longer timescales. The combined effect of orbital and solar forcing explains important details in the temporal evolution of AISM rainfall during the last 6000 years. By contrast, we find neither evidence for volcanic forcing of AISM variability nor for a control by long-term variations in the El Niño-Southern Oscillation (ENSO). After experiencing the flooding in Europe last spring and then hearing about the flooding in Calgary, I have been wondering if there is any correlation between increased precipitation and solar activity. As this study for Australia, it would be interesting if there were a study done for North America and Europe. It is possible the results could be the opposite.